Welcome to Seek See Travel. We decided to pack up our bags and buy a one way ticket to London. Here we showcase a collective of Fashion, Travel and Lifestyle articles. Enjoy! If you were to ask me what is my favourite city in the world, I would say Paris. I have been lucky enough to visit four(4) times now. Each time I have had the pleasure of going with someone else and have explored new areas. I understand that I may not be telling the same story if I lived in Paris, but I don’t, so my love affair continues. It just has this seductive charm that I can’t really explain - you have to feel it for yourself. It all started back in 2013 when I went on a girls ‘Euro trip’. It definitely wasn’t love at first sight. We stayed on the outskirts of the city, didn’t speak a word of french except for ‘parlez-vous anglais’ which embarrassingly we only knew from the famous song by Art vs Science. Which translates to ‘do you speak english?’ The jet lag and hit us and all we wanted was an Aussie breakfast of eggs on toast and were baffled that we could only find croissants and baguettes. I know.. seriously naive haha. Second trip was in 2015 when Damo proposed to me, I know, super romantic! The third trip was in 2018 when we returned for our first wedding anniversary. Falling more in love with the city (and each other) each time. And the fourth trip, and definitely not the last, was with my beautiful friend Ellen, who lived there for the summer of 2018. Now, let’s get to business. I have had a few friends ask me for travel advice when visiting Paris. So, I thought I should get my act together and write up a travel blog for you all. How to get to the French Capital. Train: If you live in London, the EuroStar is the most convenient choice of transport. It takes you 2 hours and 16 minutes. These high speed trains depart from London St Pancras International and arrive in the middle of the city at Paris Gare du Nord, meaning there is no messing around with getting to and from airports. The price ranges from £50 for standard to £300 for premier one way. From Gare Du Nord there is easy access to cabs, Uber, buses and the metro to get you anywhere in the city. Fly: Flying is often cheaper than the Eurostar but is much more hassle and takes more time. If you consider the time it takes to get to the airport and back into the city on the other end, we much prefer to take the Eurostar - leaves more time for croissants! If you do prefer to fly, there is no shortage of flights available. We normally stay in the Latin Quarter, it’s centrally located and has a great vibe. Two of the hotels we stayed in were Hotel Cluny Square and Hotel St Severin, which were both great. 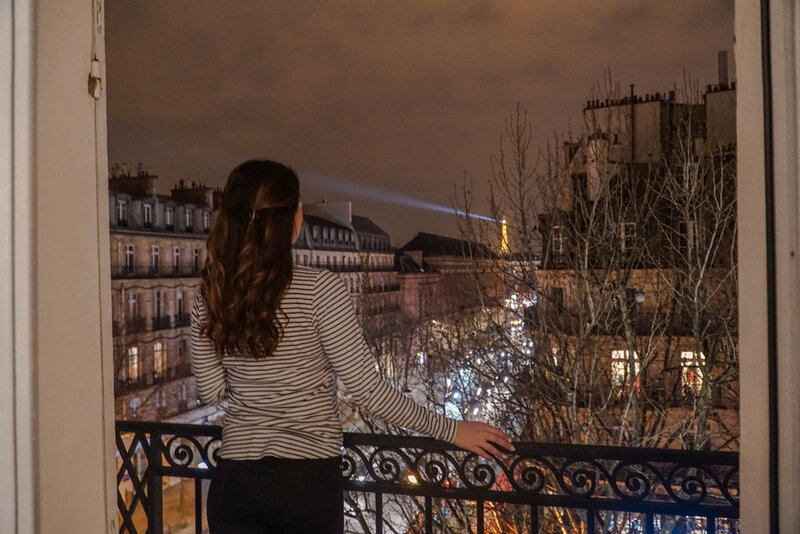 At Cluny Square we had a beautiful room with a view of the Eiffel Tower. The latin quarter is characterised by beautiful cobble stone streets and little alley ways full of bistros, cafes and bars. At night time it lights up and it’s like a scene in a disney movie. The nearest metro station to this area is called Place Saint-Michel. What to find within walking distance from the Latin Quarter. Only a short walk from the Latin Quarter you will find the Notre Dame Cathedral which sits alongside the river Seine. Close by there is also the Pantheon and the Louvre. One of my favourite things to do in Paris is walk along the river Seine and take in all the scenery. One of our favourite walks is to walk from the Louvre Museum, through the Jardin des Tuileries and up Champ Elysees to the Arc de Triomphe. Tip: Unless you’re rich, don’t shop and eat on Champ Elysees, the shop owners pray on tourists. Behind the Lourve Museum, hidden away you will find the cute little Colonnes de Buren which is a controversial art installation and next door to this you can walk through the Jardin du Palais Royal. It’s a nice quiet spot to sit and have a baguette for lunch. Another favourite spot I LOVE to visit is Montmarte. This is on the north side of the Seine, however its quite a distance so I would recommend getting the metro. The streets here are some of the most beautiful streets to walk through. I would try to go early and avoid the crowds as this is also the home of the Sacre Coeur, it gets extremely busy! Once you have explored a little it’s probably time to get yourself a coffee! If this is the case, please do yourself a favour and go to La Maison Rose Cafe. It’s a beautiful pink cafe, draped with ivy on the corner of the street. It has also become quite popular thanks to Instagram, but the wait is never too long if you want a table. Getting around is easy, most places are accessible by foot, just wear comfy shoes! Or download City Mapper app, it will show you the best transport options from A to B. Try and avoid the cabs. An obvious one - go up the Eiffel Tower! In my opinion it is actually much nicer to look at from the Arc de Triomphe. Don’t forget your manners. The Parisienne’s love it and will be so much more accomodating if you try to speak their language. BONJOUR: hello, MERCI: thank you. Google it, its not hard. Check out the Lourve Museum, but don’t expect to see everything - it’s huge. If you’re brave, unlike me! Try the french delicacy, Escargot (snails). Explore the local french markets. The flowers and fresh produce are beautiful! It’s just a little glimpse into the Parisienne lifestyle. Along the river you will find some market stalls selling all sorts of vintage things. They are beautiful collectables or perfect for gifts. Have a sweet tooth? You can’t come to Paris and not try the Macaroons. Buy a box to take home too! If you like cheese - a visit to a fromagerie is a must! You will find some of the best cheese in the world. Hot tip - pair the cheese with a bottle of wine and enjoy on the banks of the river Seine. For breakfast get Petit Dejuner, which is normally around 7Euros and you get a fresh croissant or Pain au Chocolat, a delicious baguette with jam and butter as well as a juice and coffee! Best time of year to visit the French capital. One of the most important questions to ask yourself is what month should you plan your trip? I have been lucky enough to visit the city in two season, Spring and Summer. Both have their pros and cons, I have done my best to compile a list below for you. Keep in mind all four seasons in Paris are parfait. Tip: No matter the season, always try to book in advance to score the best deals in accommodation and flights. Spring (March, April & May) this is arguably the best time to visit Paris. At the beginning of Spring in March there is still a chill in the air with the occasional hot sunny day. Colour is just starting to come back into the trees and the gardens are filling up with gorgeous blooms. Crowds are at a minimum in the main sights and get busier as May comes along. May also brings with it a lot of rain, so don’t forget your umbrella! Although this month is known to be wet, the temperature does rise from 12 degrees to 16 degrees. Summer (June, July & August) is known as the peak season. The Parisiennes will often leave the city to the tourists this time of year as it can be quite overwhelming and even chaotic. This also comes with the cost of local restaurants and bars being closed as their owners are on vacation (depending on the area in which you are staying). Have your wallet ready as these months the accommodation, flights and Euro Star will be most expensive! An advantage you have is that the days are nice and long, you can wander around comfortably up until 11pm! Summer temperatures can be very hot and sticky in the middle of the day, so late evening wanders are the common thing to do. Autumn (September, October & November) is a romantic time of year. The colour in the leaves are turning from lush green to a warm orange and there is a crispness in the air again. The days are getting shorter and colder, but not uncomfortable! It is now becoming less crowded and more enjoyable to explore the city. It’s undeniably more convenient when visiting the Eiffel Tower and Arc de Triomphe, as the queues are getting much smaller. It’s less expensive, everything is open and it’s the season for hot drinks! Winter (December, January & February) is a magical time of year. You have the Christmas markets, ice skating rinks & New Years Eve celebrations. The weather is undoubtedly the coldest in all the year so don’t forget your thermal layers, you may even be lucky enough to experience snow! Now the days are getting much shorter with the sun setting around 5pm. But with this it brings a festive spirit, most department stores and restaurants will be lit up with fairy lights. Well I hope you enjoyed this blog post. There is oh-so much more, but I need to leave something for you to discover yourselves. Thank you for reading guys and I hope this gives you some ideas for your next trip! Follow our journey on Instagram below!